To do well in school, one must have a productive and encouraging environment. This desk and hutch set provides just that. Any person could utilize the three drawers on the side for papers, writing utensils and much more while placing their computer or books on the expansive table top. The hutch includes a variety of shelves that are separated by the same solid wood dividers that craft the entire piece and give it durability, stability and longevity. The hutch also includes a built-in cork board that can be used to organize one's schedule or display fun moments. This set is a wonderful addition to any kids' room as it provides a fun yet organized place to study or browse the web! This set includes one desk and one hutch. Available in four finishes: Cherry, Dark Walnut, Oak or White. Each piece is crafted from solid wood and wood veneers. Made in Vietnam, assembly required. Spot clean, no harsh chemicals should be used. 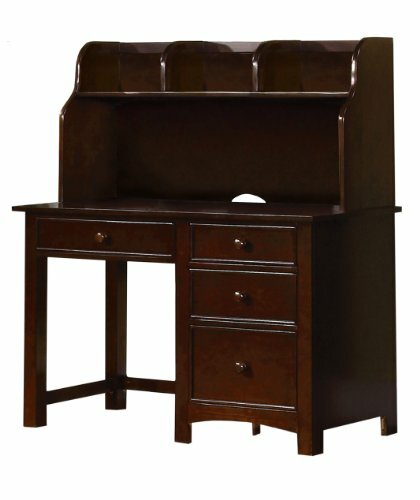 Desk: 42.13"W x 12"D x 24"H; Hutch: 48"W x 20"D x 31.43"H. Decor not included.